Balanced Growth provides premium consulting services to clients seeking to significantly improve their operations and business performance on behalf of their customers. 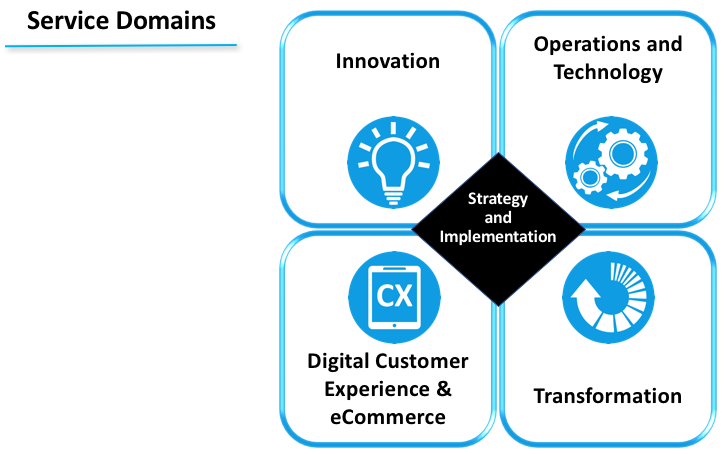 Our custom consulting services are focused in four domains: Innovation, Operations and Technology, Digital Customer Experience and eCommerce, and Transformation. Implementation activities across all of these domains are inextricably linked to our client's overarching strategy. Each of our service domains offers a number of custom consulting services. Creating sustainable value to today's marketplace requires organizations to establish a culture that inspires both strategic and operational innovation. We help our clients unlock creativity to commercialize ideas, improve efficiency, and meet emerging customer needs. The global economy of the future will demand that organizations maximize operational efficiency, operate with the lowest cost possible, and optimize the use of existing and emerging technologies. The Balanced Growth team works side-by-side with our clients to improve processes and leverage technologies that drive operational excellence, competitive advantage, and sustainable value. Organizations that have embraced the digital transformation occurring globally are generating greater value at a faster pace. Enhancing customer engagement, retention, and recruitment is how the leaders at Balanced Growth help our clients succeed in this digital age. Enterprise-level transformation can be a massive undertaking often involving a high level of complexity, a significant commitment of resources, and a lengthy transitional process. A wrong direction taken or an organization unprepared for change can be extremely costly. Using our skills with Enterprise Architecture and Enterprise Program Management, we help our clients achieve their desired future state goals. Explore our Project Summaries or ​Download our Statement of Qualifications to learn more about Balanced Growth.